A new day of Carpe Diem Haiku Kai, the place to be if you like to share your Japanese poetry. 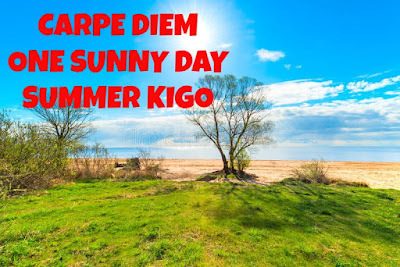 And this month is already awesome through all those beautiful classical kigo for summer (and winter of course). It's a challenge for me, because I ask you to create haiku and tanka in the classical way, but I am not really into the classical way of writing haiku. I am more of the way of Santoka Taneda and Jane Reichhold, without those rules we all know (and can read in CD Lecture 1 above). And I hope that our kigo for today will be a great source of inspiration for you too. 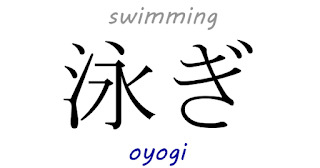 Today our kigo is swimming (oyogi). It is taken from the summer sub-division Humanity. A nice one I think and one we can all relate to. There are several sources that talk about "swimming (oyogi)", in the list I have used it's called a classical kigo, but other sources say that it is a modern kigo, so ... what to do ... with this kigo? Hm ... not as strong as I had thought, but I had some problems to create a haiku with this kigo. So I came up with a kind of experimental haiku. For our friends on the Southern Hemisphere I have a nice winter kigo taken from the winter sub-division Humanity: searching for plum blossoms (tanbai). This episode is NOW OPEN for your submissions and will remain open until June 21st at noon (CEST). I will try to publish our new weekend meditation later on. For now ... have fun! Carpe Diem Weekend Meditation #36 "like Basho"
Carpe Diem's Crossroads #11 "a winter's love"